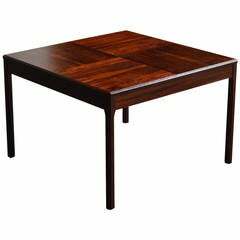 bookmatched rosewood square shape coffee table, having square rosewood legs. Simplicity at its most intriguing. Original Haug Snekkeri label on the underside, as seen in the photo's. Norway, mid to late 20th century. 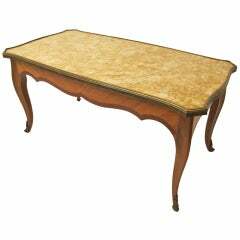 Shapely low table with marble top, bronze gallery and hardware. France, early 20th century circa 1920's. 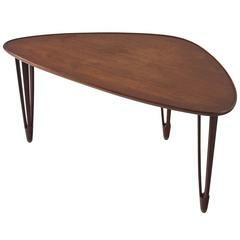 Two rosewood nesting tables with circular tapering legs. (Most likely originally a set of three). Mid-20th century, Danish modern, circa 1970. 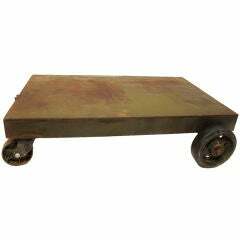 Welded iron cart handmade early to mid 20th century. Remnants of original green paint with some expected rust. 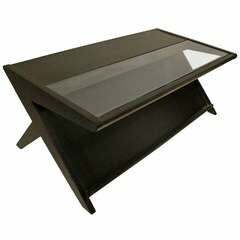 Ebonized black coffee table with inset glass top above lower shelf for magazines with X legs. Modernist, Mid Century made of oak. American, Circa 1950's. Plastic-coated tabletop wood and brass legroom: 60cm. 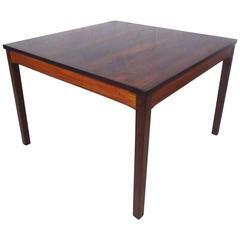 Swedish midcentury coffee table in rosewood with parquetry top made at String Seffle in Southern Sweden in the 1960's. Removable legs make this a very convenient piece to transport.